The Athens Ring or Δακτύλιος Αθηνών (Daktylios Athinon) is an area of central Athens controlled by an odd/even system, originally designed and intermittently implemented from July 1979 to save fuel during the oil crisis. It was later imposed as a permanent solution to control traffic congestion and pollution in 1982. Unfortunately, the number of cars in modern-day Athens has more than quadrupled since 1982 and legislation has not been revised to reflect this, though there has been discussion of charging drivers a fee to enter the center (κέντρο/kentro). Downtown Thessaloniki may also be subject to ring restrictions if traffic worsens, according to the Kathimerini. But for the moment, austerity and the rising cost of fuel have forced many drivers to resort to public transport. This includes electric cars and vehicles categorized as Euro 5 or Euro 6 with carbon emissions less than 140 grams/kilometer, regardless of type of fuel used. Plus hybrid vehicles in category Euro 4, with carbon emissions less than 140 grams/kilometer, using LPG and natural gas. Click “Chart” to view a list of vehicles by make/model that qualify. A green sticker issued electronically and sent free of charge had been discussed, but the Ministry of Transport announced no further details. *Originally scheduled to take effect May 1, 2012 but delayed due to change of government and several amendments. The odd/even restrictions correspond the last number of a vehicle’s license plate number to the calendar date. All vehicles with license plate numbers ending in 1, 3, 5, 7, 9 can legally be in the Athens Ring on all odd dates, i.e., September 19, October 27. All vehicles with license plate numbers ending in 0, 2, 4, 6, 8 can legally be in the Athens Ring on all even dates, i.e., June 10, February 28. Households with two or more cars should have been asked to designate one car and not be using multiple cars to drive in the center every day. Athens Ring restrictions apply from early September to mid-July. For the 2014-2015 period, the ministry has announced these dates as September 15, 2014 to July 10, 2015. Summer, between mid-July and early September. Restrictions may also be lifted during Holy Week and Christmas to accommodate shoppers and families, as announced by the ministry via Greek media. *Note that the area around Syntagma Square is closed every Sunday from 10:45 to 11:05, when evzones (Presidential guards) in traditional dress parade down Vas. Sofias for the official changing. A must-see. There are two rings in Athens, not to be confused with highway Attiki Odo (Attica Road/Highway) that many English speakers have dubbed the Athens ring road. Big Ring or Μεγάλο Δακτύλιο (Megalo Daktylio): The Big Ring encompasses the majority of greater Athens and is only (and rarely) used on high-pollution days at the discretion of the ministry. Leof. Alexandras, Leof. Vas. Sofias, Messogeion, Michalakopoulou, Merkouri Spyrou, Vryaxidos, Ymittou, Ilia Iliou, Frantzi Am., Kallirrois, Tsaldari Pan., Hamosternas, Tsaldari Pan., Peiraios, Iera Odos, Leof. Konstantinoupoleos, Achilleos, Karolou, Marni. A map may also be found inside the Attica map book, available for sale at any kiosk (periptero). 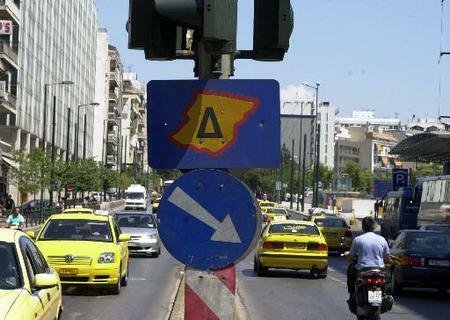 Drivers can identify when they’re in, near or about to enter the ring by looking at these signs posted around Athens with a capital Delta or ‘Δ,‘ which of course stands for Δακτύλιο or ring. Vehicles in violation of the odd/even rules can be stopped by police and fined 200 euros, according to Article 52, paragraph 6. See “Tickets and fines in Greece” for more information. 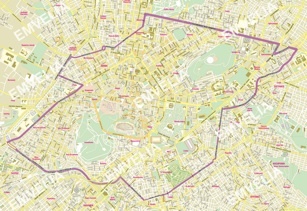 — Vehicles belonging to residents within the ring who hold a special card from the City of Athens can be in the ring one hour before the start of work and return within two hours after ending work (if you live in the ring and need a card, see below, “Where Athens Ring residents can get a card”). — Limited number of cars belonging to employees of daily and weekly newspapers and magazines, foreign correspondents, photojournalists, NET, ET1, radio station, TV channel workers, POESY and ESIEA, National Bank of Greece, active judges, airlines registered with the CAA, members of the Olympic Committee, doctors rushing to an emergency, certain IKA and Athens metro employees. The ban on diesel vehicles was lifted November 29, 2011. 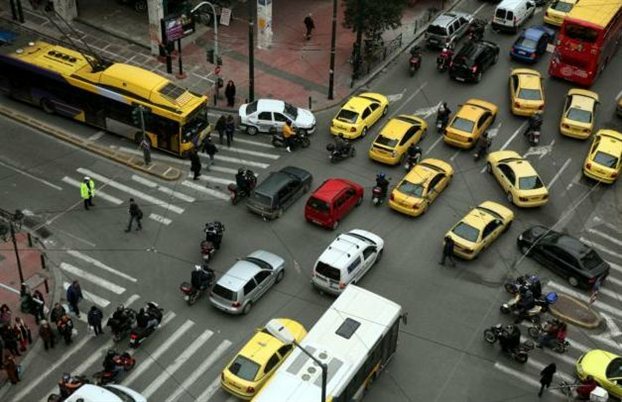 Greece was the only country in the EU to prohibit the use diesel vehicles in major cities. The card/permit is valid for two (2) years, unless a notice has been sent to revoke it sooner. Based solely on the little info you provided, I’m guessing that you’re definitely not exempt. But look in section ‘Exemptions’ to verify. I’m a non-EU citizen with a blue bebeosi permit (my husband is Greek) and would like to know for how long I am allowed to have my car (registered in non-EU country) here in Greece. I’ve read EU law on the same subject, but I’m wondering if the same applies in my case (since I’m holder of bebeosi). Depends. Where is the car registered? Is it being driven over the border of a neighboring country or was it imported? How long is the car in Greece – weeks, months, years, permanently? Are you visiting/living/working in Greece, and for how long? I advise you to seek advice from the Ministry of Transport office nearest you. Btw, answers to some of these questions also determine if you need to get a Greek driver’s license. The bebaiosi is not a residence or work permit; it’s a receipt acknowledging that documents were submitted as an application for possible issuance of a permit. Being married to a Greek guarantees nothing. A bebaiosi does not grant you EU citizenship or EU residency, so laws applying to EU citizens don’t apply to you. Is the ban on diesel vehicles in the center still valid? It was my understanding the newer diesel vehicles met pollution standards. In Exemptions, it says the ban on diesel vehicles was lifted in 2011 (aka, there isn’t a ban). Therefore, I don’t understand your question.